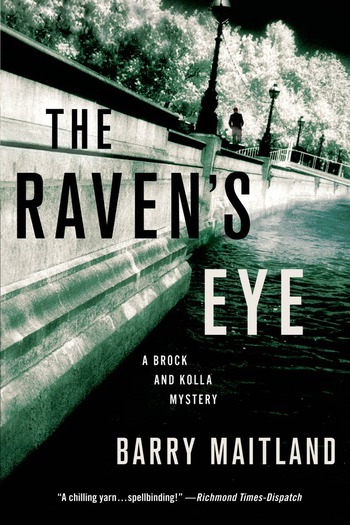 DCI David Brock and DI Kathy Kolla, of Scotland Yard, find themselves pulled into a case of murder, a mysterious death among the houseboats that line the canals around greater London, in Barry Maitland's The Raven's Eye. DI Kathy Kolla of Scotland Yard is called in as a matter of course by the local Paddington police when a woman turns up dead in what appears to be an accident. On her houseboat, Vicky Hawks is found by one of her neighbors having apparently succumbed to carbon monoxide poisoning due to improper ventilation of the narrowboat's heating system. But while the cause of death seems apparent and there's no reason for Kolla to think otherwise, something about this death still bothers her. A DARK WHITE FOG hung over the canal and spread out through the bare branches of the trees that lined its banks to blanket the tall terraces of houses beyond and creep away down the side streets. BARRY MAITLAND is the award-winning author of several previous novels featuring DCI David Brock and DI Kathy Kolla, most recently Chelsea Mansions. Born in Scotland and raised in London, Maitland lives in Australia.